detect bright flares, efficiently monitor their time behavior, correlate them with signals obtained at lower energies (X-ray, optical, radio) or even with these of neutrino detectors. obtain dense multiwavelength monitoring of the flares, to disantangle emission model parameters. study the statistics and the types of the flares. The FACT observations will be used to trigger follow-up observations with higher sensitivity Cherenkov telescopes (MAGIC, VERITAS, and H.E.S.S. ), X-ray satellites (Swift,INTEGRAL), optical and radio telescopes. Centaurus-A, a closeby Active Galactic Nuclei emitting a powerful jet. Credit: CSIRO. Blazars are Active Galactic Nuclei (AGNs) characterized by a polarised and highly variable non-thermal continuum emission, extending from radio to γ-rays, produced within a relativistic jet that originates in the central engine and points close to our line of sight. Since the relativistic outflow moves with a bulk Lorentz factor (Γ) and is observed at small angles, the emitted fluxes are affected by a beaming factor δ. The broadband spectral energy distribution (SED) exhibits typically a two bump shape. According to current models, the low energy bump is interpreted as synchrotron emission from highly relativistic electrons, and the high energy bump is related to inverse Compton emission of various underlying radiation fields: the same synchrotron photons in the case of synchrotron self Compton model (SSC), and UV and/or IR thermal photons produced externally to Jet in the case of external radiation Compton (ERC) scenario. Blazars come in two main flavours: BL Lac objects, characterised by featureless optical spectra and interpreted in the framework of pure SSC scenario, and Flat Spectrum Radio Quasars (FSRQ) characterized by prominent emission lines which are likely to have the IC component dominated by the ERC emission. BL Lac objects are often classified according to the peak energy of the synchrotron emission, which reflects the maximum energy the particles can be accelerated in the jet, into: low energy (LBLs), intermediate energy (IBLs), and high energy synchrotron peak objects (HBLs) respectively called LBL, IBL and HBL. HBLs are the largest fraction of Blazars detected at TeV energies, where exhibit often rapid variability, down to the scale of minutes. Acceleration process able to produce particle radiating at TeV energies and the understanding of such a rapid variability, are still open issues, despite the large number of observations, weakened often by the lack of simultaneous multiwavelength data and/or long term sampling. HBLs represent the most extreme accelerator among Blazars. Their synchrotron component, that is typically peaking at X-ray energies, is often detected up to hard-X-ray energies. The Lorentz factor of the particles radiating at X-ray and hard-X-ray energies is of the order of γ ≃ 106 , where B is the magnetic field intensity, and z the cosmological redshift, with Bδ, in the case of HBLs, typically of the order of unity. Within the SSC framework, TeV photons in HBLs are produced through the IC process by electrons radiating at X-ray energies upscattering most efficiently Optical/UV photons, hence the IC process is happening mostly in Klein-Nishina regime, with the corresponding IC photon energy of the same order of the scatterers energy, namely γmec2. TeV detections of HBLs, hence probed the capability of Blazars jets to accelerate electrons up to TeV energies. Anyhow, the Bδ degeneracy, often enhanced by the lack of simultaneous multiwavelength observations, makes possible to find several combinations of the parameters that produce models matching the observations. Temporally well sampled trends of the peak dynamics, both at low and high energy bump, would allow to constrain the value of B, making firmer the constraint on γ. At this regard, FACT with his monitoring program of bright TeV Blazars, will represent a unique opportunity to have long trend monitoring of the dynamic of IC spectral evolution, both during flaring and quiescent states. Such a kind of sampling, together with MW simultaneous data, would allow to test both single and multi-zone SSC leptonic models, and to discrimate between predictions from hadronic vs leptonics frameworks. Constraining the maximum energy of accelerated particles, and understanding the leptonic to hadronic ratio in the composition of the jet, will play a key role in the physics of Cosmsic Rays (CR), making possible to understand the contribution of Blazars to the CR population above the knee (E > 103.5 TeV). The Rapid variability observed in TeV emitting Blazar, due to the very short cooling times of the high energy emitting electrons, gives strong constraints on the size of the accelerating/emitting region, R ≤ . 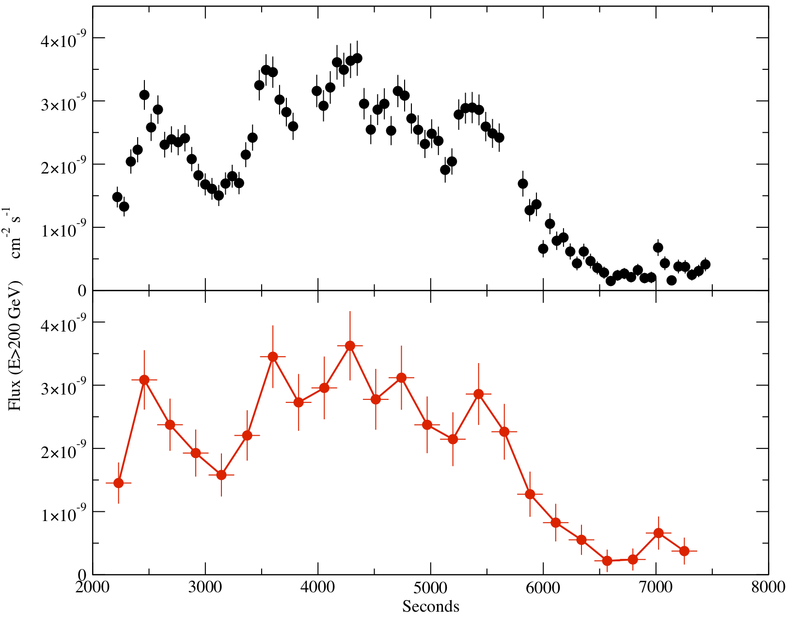 TeV Blazars often exhibit variability even of the order of minutes, as in the case of PKS 2155-304 in summer 2006. These times scales require sizes of the order of 10[12-13]δ∕(1 + z) cm. These sizes are quite challenging, and in the case of PKS2155-304, results smaller than the gravitational radius of the black hole derived by the mass-luminostity relations. Models to explain this variability requires structured jet and/or beaming factor in excess of 50. Understanding if these episodes are rare, and/or common to several sources, is mandatory to have deeper comprihension of HBLs as a population. The FACT long-term monitoring of bright HBLs, will increase the possibility to catch these rare and very rapid flaring episodes, allowing to put further observational constraints useful to their understanding. Rapid variability of the blazar PKS 2155-304 observed in the TeV energy range by HESS (top) and as it would have been observed by the much smaller FACT telescope (bottom). Another puzzling feature is represented by TeV orphan flares, as in the case of PKS1959-650 in spring/summer 2002. Such behavior challenges strongly one-zone models and represent further observational constraints to the theoretical models parameters. Also in this case, the FACT monitoring program will be relevant, by increasing the possibility to observe further TeV orphan flares.